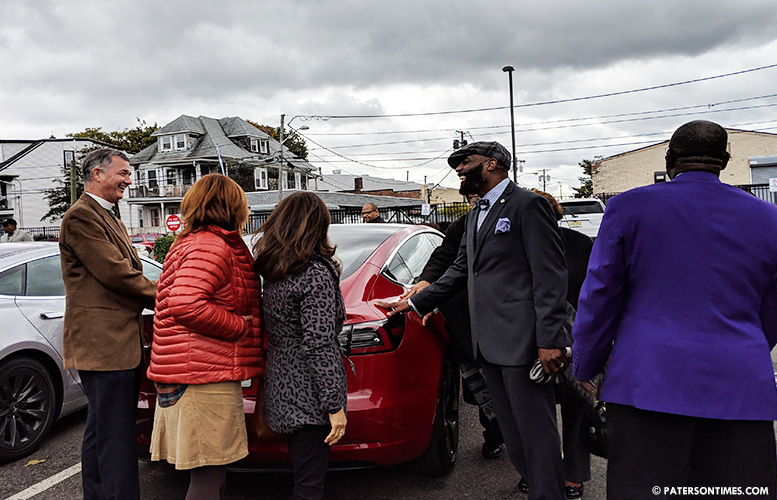 A small group of religious leaders placed their hands on a red Tesla in the parking lot of the Calvary Baptist Church on Monday morning and blessed it by citing the benefits of zero-emission electric vehicle for dense urban areas. Organizers for the event had five cars – four Tesla and one Chevy – to expose residents to electric vehicles or EVs. A dozen or so people took the vehicles for test drives in the first hour of the event. Jackson said she often drives to Virginia. She is able to fill up her tank from roadside gas stations. Electric charging stations are not as ubiquitous presenting a problem for long distance drivers like Jackson. There are 644 charging stations in New Jersey. There are none in Paterson, according to the Alternative Fuels Data Center at the U.S. Department of Energy. Ashley-Lynn Chrzaszcz of ChargEVC said that could be changing very soon. She says there’s a bill, No. 2252, before the New Jersey Legislature that calls for an expansion of electric vehicle charging infrastructure in the state. Chrzaszcz said the bill could make New Jersey a leader in electric vehicle adoption. It will help New Jersey “leapfrog” other states, she said. Citing New Jersey Motor Vehicle Commission data, she said there are 19,000 electric cars on the road. She wants that number to hit 330,000 in the next few years. Speedy adoption of electric vehicles in New Jersey is a win for owners, the environment, and residents, said Chrzaszcz. Electric cars cost less money to maintain. For example, there are no regular oil changes. “There’s a lot of air pollution in cities like Paterson,” she said. She said air pollution will significantly drop with fast adoption of EVs in urban areas. Chrzaszcz said religious leaders view themselves as the “stewards” of the planet. “It’s necessary for them to take care of the earth,” said Chrzaszcz. “This is an issue for the faith-based community. This is an issue of social justice,” said pastor Randall Lassiter of Calvary Baptist Church. His church held the peculiar vehicle blessing event in partnership with ChargEVC, GreenFaith, and Jersey Renews. There have been three such events — Princeton, Trenton, and Asbury Park — in New Jersey, according to organizers. Some of the pastors said electric vehicle adoption may be a little slow in the state’s poor cities. “It’s very pricey,” said Roy Jones, pastor at the Good Shepherd Baptist Church on Lafayette Street. Organizers said there’s a developing used market for electric vehicles. Though batteries erode over time, many hold up for many years. Motorists in cities drive shorter distances, said organizers, which makes range anxiety less of an issue. Owners of electric vehicles often have charging stations in their garage. City dwellers often park on the street. Creative countries in Europe have overcome this problem by equipping electricity poles with chargers. Shell is installing chargers in its gas stations throughout Europe. “I feel good about driving and not polluting,” remarked pastor Fletcher Harper, executive director of GreenFaith, after getting out of a Tesla. Chrzaszcz said the bill before the legislature is expected to pass early next year.